Sure to please any user who demands an enormous amount of functionality, the Aerocool CoolPanel 3 Multifunction Panel is here to complete Aerocool's epic trilogy of quality PC device input and temperature monitoring. Offering an incredible amount of features, the newest version of the CoolPanel boasts over 2 USB ports, an e-SATA port, a 56-in-1 card reader, as well as the appropriate audio and microphone ports. 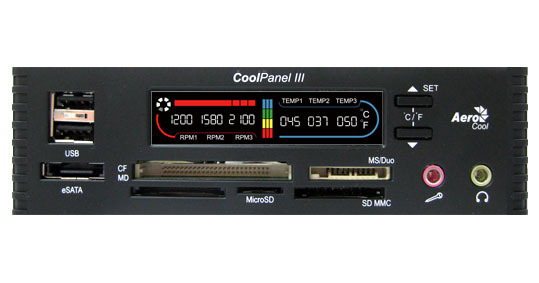 The Aerocool CoolPanel 3 also features a Color LCD fan controller which is designed to detect and control over 3 sets of fan speeds and temperatures. The Multifunction Panel also offers Automatic Fan Control, a Manual Setting for Alarm Temperature, and the option to switch your settings between Fahrenheit and Celsius. For added protection, an Alarm Temperature Warning is also included within the CoolPanel 3 to keep the user prepped on any oddities that might be occurring within your system.